The ancient Hindu festival of Holi took place in Nepal yesterday and is possibly one of the most famous Hindu festivals in the calendar. It is the festival of colour and we know it as being the opportunity to run around the streets throwing powder paint at each other… However, the story goes much deeper than that. Firstly, the festival lasts for a week although it is only the last day, on full moon day, that is observed with all of the colour. Not much happens in the first few days of the festival, you’ll see plenty of people on the streets selling the coloured powder for the end of the week and, mostly children, thinking it’s OK to start ‘colouring’ people a few days early! Holi celebrates the beginning of the new season, spring. Going back to 17th century literature, the festival celebrated agriculture, good spring harvests and the fertile land. It is a time to say goodbye to winter and enjoy the abundant colours that come with spring. In this time of ‘new starts’ it is also an opportunity for Hindus to end conflicts and repair relationships. Holi is of significant religious importance to Hindus and is signified by the legend of Holika. It is said that Holika conspired to kill her nephew Pralhad because he was devoted to Lord Vishnu. The attempts on Pralhad’s life were in vain because Vishnu protects those who love him. Instead, Holika was burnt in a fire. Holi is said to be celebrated to rejoice Holika’s death and the traditional bonfires, the night before the colour, are believed to commemorate her death. People gather around the bonfires singing and dancing. For everyone in Nepal, Holi is a time for fun and frolic. A day when everyone forgets the worldly anxieties and just enjoys the finer things in life. 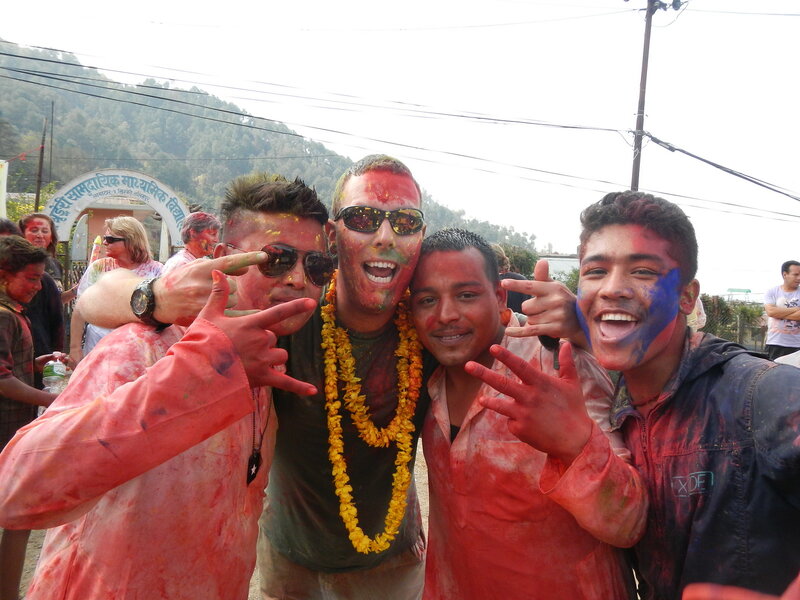 Experiencing Holi was truly amazing. It seemed like the whole village came together to have fun and get into the spirit of things. Some of the kids had been up since 3am as they were so excited! The event itself was chaos but that’s part of the fun, powder flew in all directions with people smothering your face with powder or emptying buckets of water over you (as happened to Rebecca!). There was dancing (complete with a local drummer under the bus shelter), singing and chants of “Holi, Holi!” (One of which I led after being hoisted onto the shoulders of some of the villagers!). 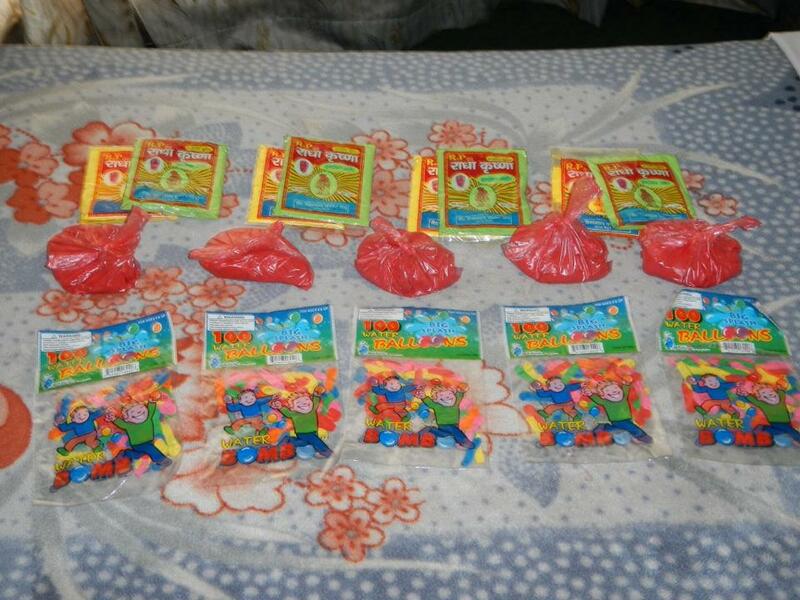 The young kids were especially accurate with water bombs (they got me in the head with one en route to the school in the morning) and whenever I opened another packet if powder I had 5 kids ready to ask for some. It was a truly amazing day and spending it with family and great friends in the “real” Nepal was an experience I’ll never forget. It was a hundred times better than staying in Kathmandu for it. I guess the only really downside is getting clean afterwards, I must have spent half an hour trying to wash off the colour and today my scalp is still red and there’s paint in my ears! Thanks Chris! 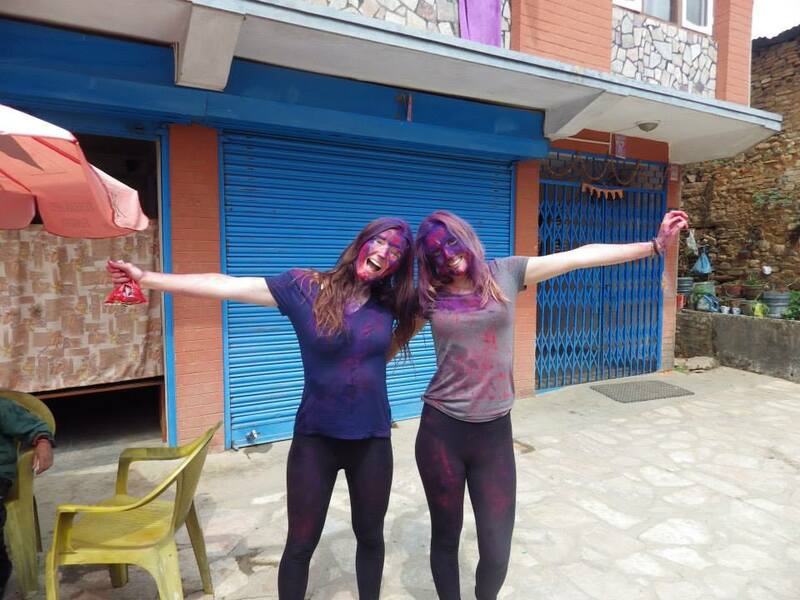 To be in Nepal as a volunteer during Holi 2015, sign up to our January 2015 Nepal volunteer programme. Oyster volunteer, Chris carefully prepared for Holi!